Click the buttons below for a description of what the button does. Click the browser BACK button to return to the top of the list. The H1 button inserts a heading tag of size 1. With the KB's standard stylesheet, the font size is 20px and bolded. The H2 button inserts a heading tag of size 2. With the KB's standard stylesheet, the font size is 18px and bolded. The H3 button inserts a heading tag of size 3. With the KB's standard stylesheet, the font size is 16px and bolded. The H4 button inserts a heading tag of size 4. With the KB's standard stylesheet, the font size is 14px and bolded. The P button wraps the selected text in the <p> tag which is used to mark paragraphs. Space will automatically be inserted before and after a paragraph to separate one paragraph from another. This is a paragraph. It can be long or short. If it's a long paragraph the text will wrap to the next line. The PRE button wraps the selected text in the <pre> tag which defines preformatted text. Text in a pre element is displayed in a fixed-width font (usually Courier), and it presereves both spaces and line breaks. Useful tag for displaying computer code. The Red button wraps the selected text (or inserts at the current cursor position) in a <span style="color: red;"> tag with CSS to color the text red. The Green button wraps the selected text (or inserts at the current cursor position) in a <span style="color: green;"> tag with CSS to color the text green. The Big button wraps the selected text (or inserts at the current cursor position) in the <big> tag which slightly increases the size of text compared to the standard <p> text. The Small button wraps the selected text (or inserts at the current cursor position) in the <small> tag which slightly decreases the size of text compared to the standard <p> text. The B button wraps the selected text (or inserts at the current cursor position) the <strong> tag for bolding the text. The I button wraps the selected text (or inserts at the current cursor position the <em> tag to italicize the text. The U button wraps the selected text (or inserts at the current cursor position) the <u> tag to underline the text. The S button wraps the selected text in the <s> tag to draw a line through the text. The Sup button wraps the selected text in the <sup> tag which causes the text to appear in superscript. The Sub button wraps the selected text in the <sub> tag which causes the text to appear in subscript. The Center button wraps the selected text in the <div style="text-align: center;"> tag with CSS to center the text. The Right button wraps the selected text in the <div style="text-align: right;"> tag with CSS to right align the text (align text to right margin of the page). The Blockquote button inserts the <blockquote> tag which indents text. This is useful for setting off long passages of quoted text. The BR button inserts a <br /> tag at the current cursor location. This will insert a linebreak. The <br /> tag can be used to place text on a new line without fully spacing it as with the <p> tag. Note: no end tag is required. The HR button inserts an <HR /> tag at the current cursor location. This will insert a horizontal line or rule extending across the page. The Img button inserts the <img> tag at the current cursor location. Clicking the Img button opens a popup box. Enter the path and alt-tag/title for the image you are linking to in the popup box. Note: no end tag is required. The Img tag is rarely used. Images are more commonly inserted by using the Attachment section of the Doc Editor. For more info see 5722 and KB User's Guide - Documents Tab - Insert an Image from another Website . The < > button inserts &lt; &gt; which are HTML Entities that will be interpreted by your browser as a pair of less than and greater than signs. Less than and greater than signs are just some of the characters that are reserved in HTML. It is not possible to use the less than (<) or greater than (>) signs in your text because the browser will mix them with HTML tags. To actually display reserved characters (like less than and greater than), character entities must be used in the HTML source code. The <!/ button inserts an HTML comment tag at the current cursor location. The comment tag is used to add informational text in the HTML source code. Comments can be read by developers reading the code but comments are ignored by browsers and are not displayed. The FullscreenToggle button allows you to expand the body field to the full screen. Click the FullscreenToggle button again to return to the standard view of the document editor. The LI button wraps the selected text in the <li> tag. The Link button inserts a standard hyperlink. The button will cause a popup to open. Enter the URL and click OK. The Anchor button inserts a named anchor. This allows linking to specific sections within a document. The Maillink button inserts an email address as a link. Clicking the Maillink button opens a popup box. Enter the email address you are linking to in the popup box. The KbLink button inserts a relative link to a KB document. The ToTop button inserts a link that allows the reader to jump to the top. A permanent anchor placed at the top of all KB documents. The custom tag allows you to insert a link pointing to this anchor. When inserted, the link will read "To the top". You can, however, edit this as desired. Additionally, there is a custom div tag inserted around the link, which allows you to style the link as desired. The Form button allows you to embed a Generic Comment/Feedback form into your KB document--to easily collect data from and have it emailed to the address of your choice. The LinkTopic button allows you to embed a topic link into your KB document. When you click on this link, all the documents in that topic will appear on another screen. You may decorate the Topic Name using CSS. The LinkDoc button inserts a custom tag which allows linking to other KB documents via document number. Care must be taken if doc is to be shared. The IncludeDoc button wraps the selected number (a valid KB doc id) in an anchor tag where class="includedoc". This custom class will then embed the contents of that doc into the host doc. Care must be taken if the doc is to be shared. Allows up to five layers of inclusion. 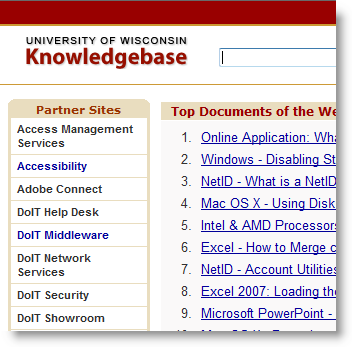 See KB User's Guide - Documents Tab - IncludeDoc and Dynamic Web Page Content for more information. Open the document editor in HTML Source mode view. The ImportHTML button is located above the Body text input box. The ImportHTML button imports HTML from any accessible external URL. When we say accessible, we mean external URLs that are not employing restrictions on their web pages. The IntSite button wraps the selected text in a span tag where class="internal". Text wrapped in this custom class will only be visible on internal KB sites. The ExtSite button wraps the selected text in a span tag where class="external". Text wrapped in this custom class will only be visible on external KB sites. The OwnerSite button wraps the selected text in a span tag where class="ownersite". This tag allows authors to embed site specific content anywhere within a KB document (or news item). Site specific content is visible to owner site only even when the document is shared across multiple sites / groups / institutions. The OwnerInstitution button wraps the selected text in a span tag where class="ownerinstitution". This tag allows authors to embed institution specific content anywhere within a KB document (or news item). Institution specific content is visible to owner institution sites only, even when a document is shared across multiple campuses / schools. The HtmlEntity button wraps the selected text in a custom <htmlentity> tag. This custom tag preserves HTML markup in KB docs. This allows HTML type markup langueages to be embedded and displayed in KB documents more conveniently. Typically markup tags need to be manually escaped in order to display them in a client browser. Any text wrapped in the "htmlentity" tag will be displayed "as is" without browser interpretation. The ValidateHtml button checks your document to make sure it follows current HTML standards. Valid HTML code is more likely to display correctly in all browsers so this is a worthwile step to take in the document authoring process. A popup will display either letting you know that your code is valid or it will display any errors found on the page.